On September 5, Navy Region Hawaii hosted a Joint Services Suicide Prevention Proclamation signing at Freedom Tower on Joint Base Pearl-Harbor-Hickam in support of National Suicide Awareness Month. Governor Ige, Hawaii-based service members, Department of Defense personnel, military families, High School Army and Navy ROTC members, state representatives and community members came together to pledge to help prevent suicide related deaths. Governor Ige, Rear Admiral Brian Fort, commander, Navy Region Hawaii Navel Surface Group Middle Pacific and other Hawaii military leaders signed the proclamation. 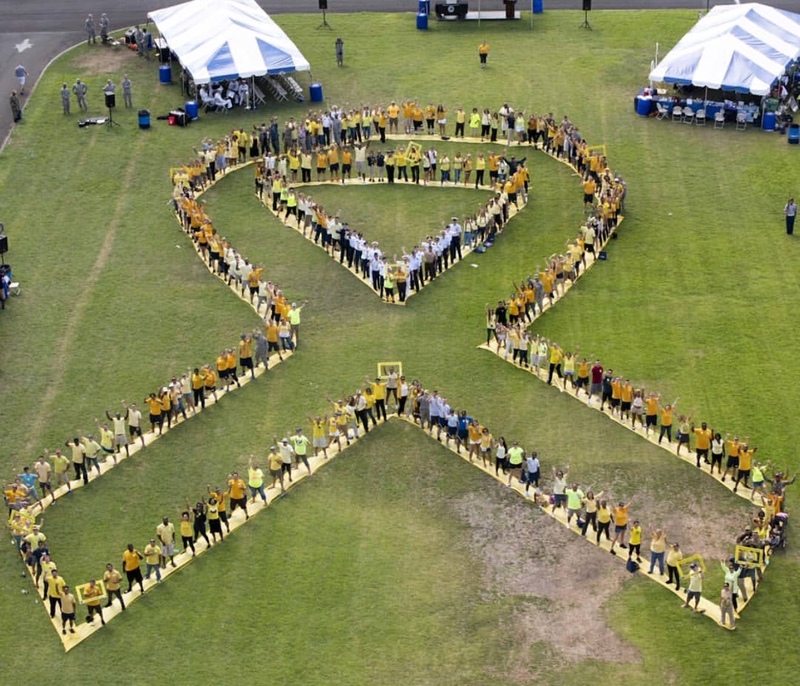 The event also included more than 200 people forming a human chain in the shape of a yellow suicide awareness ribbon. This is believed to be the first on a military installation on Oahu. Organizers also held a mini-suicide prevention fair that provided information and resources to participants. Emergency Medical Services and Injury Prevention System Branch (EMSIPSB) and the statewide Prevent Suicide Hawaii Task Force (PSHTF), the major statewide, community-driven suicide prevention/mental health collaborative in Hawaii, includes service members from all branches of the military. All task force members work in suicide prevention/mental health and/or are concerned community members wishing to raise awareness around the issue, and many have also been personally impacted by suicide/mental health issues. In 2017, the PSHTF in collaboration with EMSIPSB completed a strategic plan to reduce suicide 25% by 2025. This ambitious year and a half undertaking resulted in goals that include; increasing public awareness and communication around suicide; increased statewide capacity for suicide prevention training among multiple levels and disciplines; increased supports among those touched by suicide and those with lived experience; and increased capacity to respond to individuals and communities affected by suicide and those with mental health challenges.